Native to central and north Florida and much of the Southeast and Gulf Region, trumpet vine is found in moist woods and disturbed sites where it receives partial to full sun. Trumpet vine is a perennial woody vine that can be grown as a sprawling shrub. The compound leaves are six to fifteen inches long and the large trumpet-shaped flowers are orange to red. In Florida, they bloom from spring through fall. 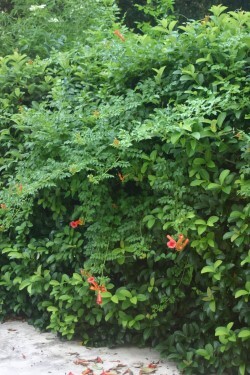 Trumpet vine grows aggressively, spreading by self-layering and root suckers. When planted in a dry sandy spot, it is easy to keep in bounds if you keep an eye on it. In moist, fertile soil, it will probably be too happy. 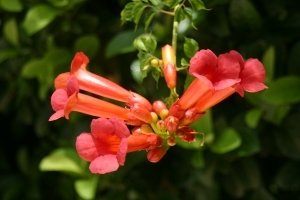 Trumpet vines will produce more blooms if planted in full sun and poor soil. While most sources say it is "fairly drought tolerant," my experience with it is that it is very drought tolerant in central Florida even in full sun and good ole Florida sand. Trumpet vine will climb anything and cover it, if given the chance. It will cover fences and sheds, climb up tree trunks, and cascade down over hedges. The aerial roots will harm masonary and painted surfaces. Now you know the negatives. Each is also a positive: easily-grown, fast grower, soil, sun, and moisture tolerant, drought tolerant, plus clusters of large bright flowers that attract hummingbirds. Plants of the bignonia family, Bignoniaceae, produce flowers that attract hummingbirds.